Iliffe Media has continued its regional press expansion by purchasing fellow independent publisher the KM Group in a ‘white knight’ deal. The deal will see Iliffe take over the Kent-based KM’s 13 weekly newspapers, as well as the Kent Online news website and radio station kmfm. The deal represents the latest stage in the expansion of Iliffe Media, following the launch of the Cambridge Independent in 2016 and the acquisition of 13 titles from Johnston Press earlier this year. The media brands to be taken on include the flagship Kent Messenger and Kentish Gazette newspapers, as well as regional news site Kent Online, radio station kmfm and TV channel KMTV. KM Media Group chairman Geraldine Allinson said the deal would allow KM to continue to evolve and bring about much needed investment to maintain its independence and continue to serve the people of Kent with trusted news and other valued content. It also enables KM to resolve the long-standing issues surrounding its closed final salary pension scheme. Geraldine, who will remain fully involved with KM Media Group, said: “The directors and I believe this deal represents the best possible outcome for our staff and customers. “Although there is some personal sadness for me and my family that our pension liabilities have led us to this position, in Iliffe we have found a publisher which shares our belief in the importance of local media. “The Iliffe family have extensive experience and heritage in local media, publishing and printing dating back to 1891, and have very similar values and ethos to us at KM. David has also been appointed as a non-executive director to the board of KM Media Group, with immediate effect. In February, Iliffe purchased 13 titles from Johnston Press in East Anglia and the East Midlands. 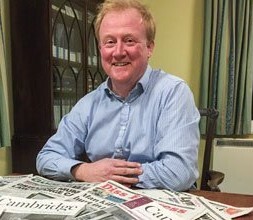 It also launched the paid-for Cambridge Independent in September 2016. A lot of titles in East Anglia were facing very bleak futures before the investment of the Iliffe group. Now it seems the short-term futures of a lot of Kent titles are also looking a little rosier. Thank goodness there is a media group that still appears to care for the industry. Is Eddy Ilife going to build it all up and dump them like he did with the previous incarnation of loyal workers working for his titles when they merged (cough) with Northcliffe to create Local World? Time will tell. Lets be honest if they weren’t serious about getting back in to the industry then they could have made a hell of a lot more selling or developing the press site at Milton. I have a feeling that the whole LW merger/Trinity sell out didn’t go the way they thought it would especially when they couldn’t get their prized Cambridge titles back and shutting down the former MK News, a prized title to many there, must have seemed like heresy. I wish them all the best in the future and hope they keep this expansion going.